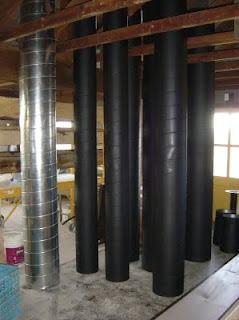 We spent most of our morning picking up the A/C spiral ducts. We had dropped them off on Monday at Mark's, who was going to spray-paint them. The spiral duct comes in galvanized shiny silver only, which would have looked to intrusive against the beer hall ceiling. So we decided to paint them in a stealth black. We'll have one duct each on either side of the beer hall running the entire length, and suspended off the ceiling. I finished cutting and placing all the wood around the chimney in the bar this morning, which turned out quite nice. I still have to nail it down, though. I meant to work on a similarly easy floor project for the rest of the day, but I had a brief intervention with myself, where I had to admit that the only reason why I was picking the easy floor projects was, that I wanted to avoid the more difficult ones. 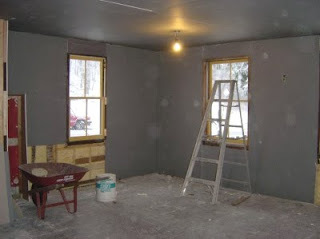 This intervention was successful, and so I drudged up to the third floor, armed with pry-bar and nail puller. Here is the scene of the crime. The glass jars are E! 's beer vinegar, souring away. I harvested three rows of flooring for now, which took three or so hours (houses aren't built to be easily deconstructed, especially not, if you're interested in preserving the building materials). This is where the wood will be used. ... and on with the good stuff. ... and covered it up again. There is still a little infill necessary, which I'll do after I get a few scrap pieces from the other floor work. Off to the floor around the chimney. 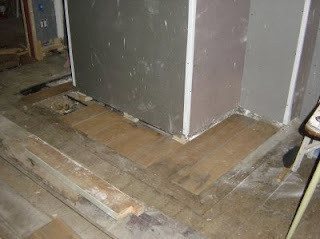 I started filling it with old flooring from the basement, which needs to go to make space for the walk-in cooler. 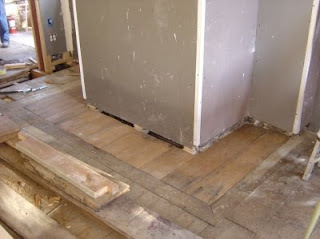 These planks are oak, unlike the floor in the bar, which is pine, but this isn't a problem, as the different wood will will create a nice contrast. 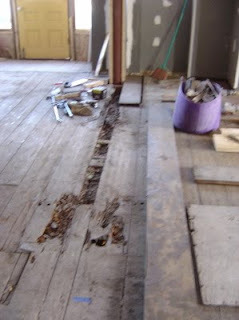 I finally ripped up the last pieces of old flooring in the bar today, which was easy. 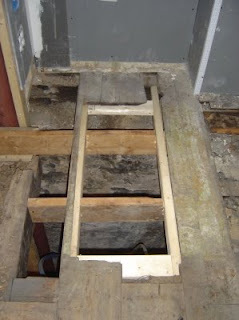 This, however, was followed by pulling all the little nails that hadn't come up with the wood. 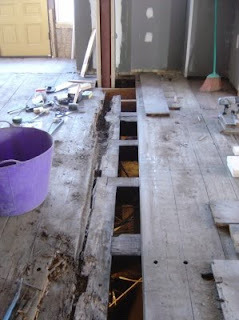 Especially the last layer of thin oak flooring left a lot of nails behind. Do I need to say, tedious. Now comes the phase of restoration, which I am dreading a bit, largely because I don't know yet how I want to do it, but it will be done, and it will look good (enough), and you'll love, or E! will liquor you up until you love it. 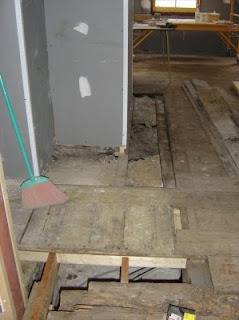 Here's an example of damaged flooring (yes, I am talking about the hole in the ground). We were over at E! 's sister yesterday morning for yummy waffles, and winter fun activities. The Yodel King does it again. For the most part it was just another day that ends in Y. I just didn't see myself kicking back the entire day, so I continued ripping up the floor in the bar. Although I uncovered some damaged board, it didn't come as a surprise. 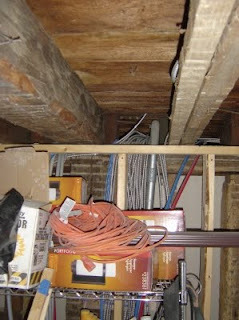 I spent many a times in the basement looking up, gauging where to expect problems, so I knew all along where the snags would be. The big question was always how the surface of the boards would look like, and I am happy to report that they look great. 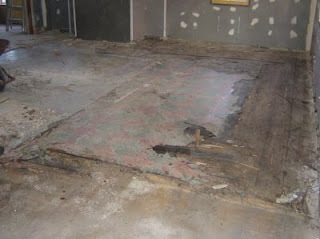 The floor in the bar is starting to look better and better. 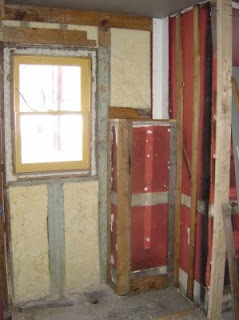 The top plywood layer is all gone, and the second plywood layer is two thirds gone. 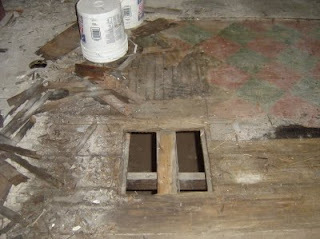 The damage to the floor so far is limited, like this hole (which I knew of already). 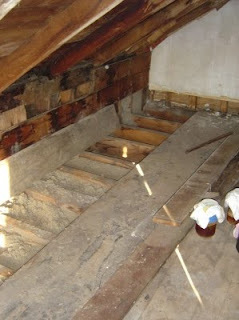 We'll most likely ravage one of the garrets to get matching wood for infill and repair. I just received a few pictures from Sarah, who had visited us last weekend. Thanks, Sarah, we miss you. E! doing research for the menu. 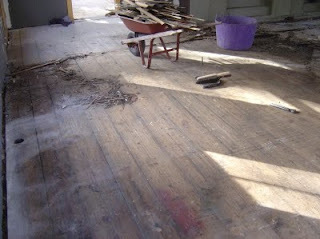 Ripping up the floor in the bar is backbreaking, and dusty. 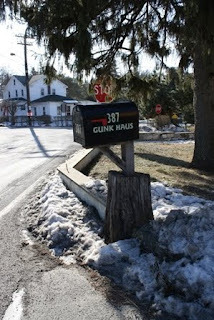 And this is what it's all about, no, not the mail box, Gunk Haus!!! 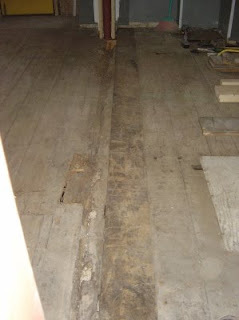 The peeling of the onion floor in the bar continued today, and I uncovered the first section of the original wide plank flooring, which we intend to restore. So far it is looking very good. This is no surprise, because I uncovered an area which I suspected to be without blemish, aside from that, it had been covered for the last 90 years. How do I know it has been covered for 90 years? 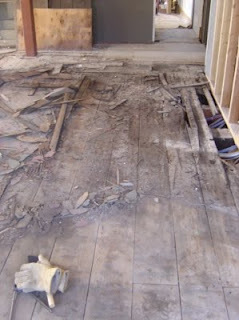 As you remember, just above the wide plank flooring is a 3/8 inch oak flooring, and between the two I found a 1919 issue of the New Paltz Times, the April 9, 1919 issue to be precise. As World War I was over the next big news was the announcement of the schedule change for the Wallkill Railroad. 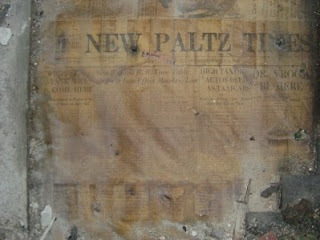 Aside from the New Paltz Times, I also uncovered an April 11, 1919 issue of the New Paltz Independent. What this means is that in 1919 New Paltz, a town which today has less than ten thousand inhabitants, supported two newspapers. Now that is impressive. 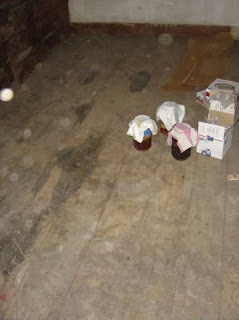 I am certain you remember the work on the front entrance, and how I stripped the floor in that area to the original wide plank flooring. 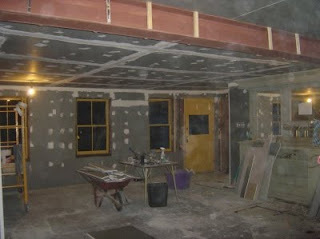 Well, now that the ceiling in the bar is plastered, the floor is ready to be fixed up. We have a friend of E! 's stay for the weekend, and put her straight to work. Although it doesn't seem like it, but we're good hosts: We provide shelter and food, and drugs to heal your aches and pains. 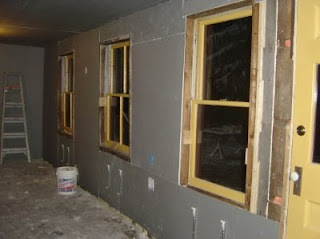 It was a long day, but we are ready for plastering tomorrow. 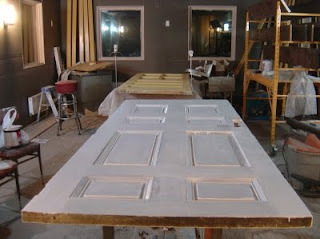 We got the seems taped, sanded, and plaster welded. 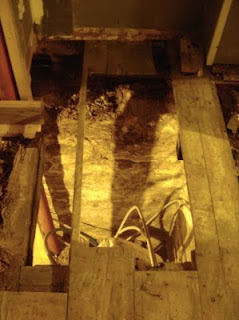 Visible in below picture is part of the wood cover for the steel beam, which I installed today. Tomorrow is going to be a long day. 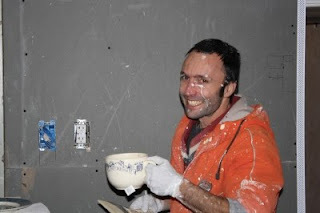 Jack will be here at 8am, and then it's bang, bang, bang, plaster the bar ceiling. Fortunately we are invited to two parties tomorrow evening, so we can chill out and relax. 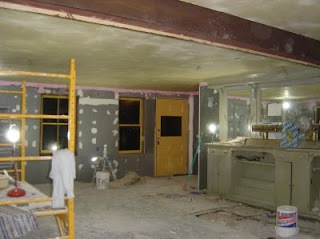 It has been so slow drywalling the bar, but finally we put the last piece up today, almost. 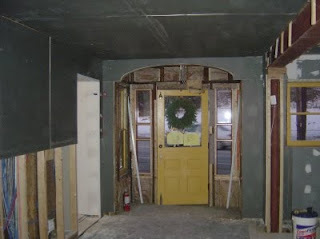 We didn't actually close off all the walls in the bar. 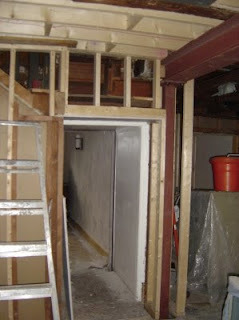 For one thing, the entrance still needs to be done, and along the north wall the lower section is still open. 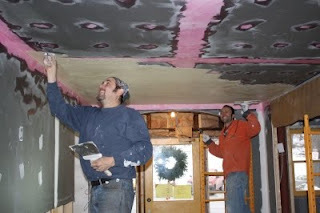 Our main goal is to get ready for plastering the ceiling on Saturday. 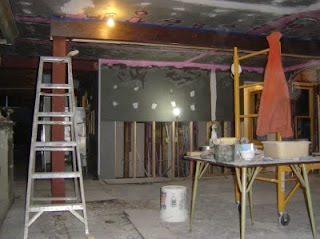 The walls won't be plastered until we have fixed the bar floor, and hence they don't need to be completely covered. E! is the best taper west of South St, and beyond, and today she applied her skills in the bar. 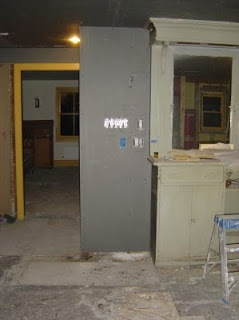 Drywalling the bar was (and still is) not easy, because of the crooked walls and many corners. But that does not deter a master taperess. I entertained myself with framing out the area to the right of the bar. 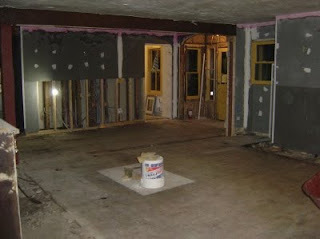 For those of you who haven't been following this blog for a while, in this area used to be a landing and stair to the second floor. 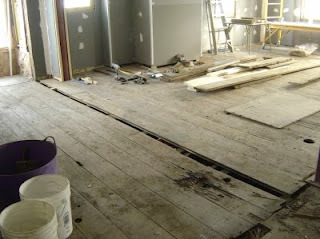 I removed half the landing and a few steps in February, and framed out the ceiling, but never did anything underneath. 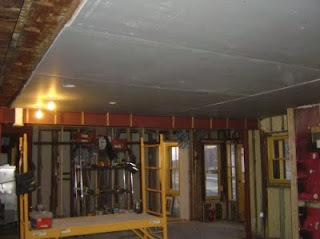 At long last we hung some more drywall today, closing almost the entire ceiling. Still some more sheets to go. 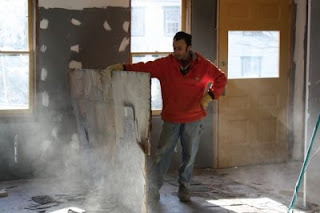 I had wanted to be done drywalling the bar by Sunday, ambitious, I know, but I painfully realized today that we don't have enough drywall, and we're not going to get more until next week (we have to special order it, and it usually takes a day or two for it to come in). I told you before about the whole planing ahead, and clearly I failed that this time. 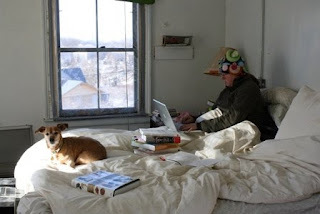 This doesn't mean we'll just sit there and wriggle thumbs, there is plenty of work to be done. 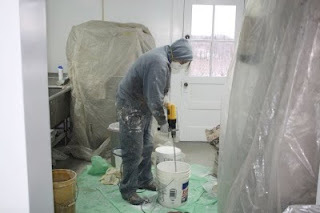 Home renovation, as much as home construction, is a massive logistical operation. If you don't think ahead, way ahead, you end up having to do more work, or redo work you did already. So far we did a pretty good job at thinking ahead, for the most part, but sometimes we miss a thing or two. Nothing that can't be fixed, until you have all the walls closed off. As we are about close all the walls in the bar, it was time to think what was still missing. 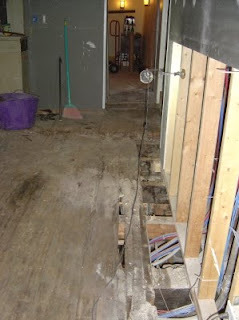 Turned out, we forgot to run two additional wires to the kitchen. These wires run through the ceiling of the wait station, which is rather crowded. As you know, we already closed off the walls (and ceiling) in the wait station, so the only way to get a wire to the kitchen is by employing smart rats, who pull the wires through. Alternately, you push a fishing line through the little cavity (as shown in below picture, where all the wires disappear), and pull the wire through (if you do own a smart rat, who can perform such tasks, I really want to talk to you). 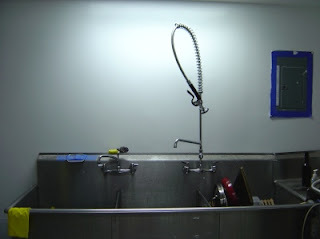 And while I was running wires, I also installed a wire for the second floor bathroom. 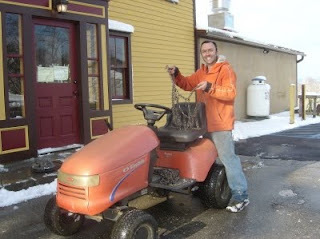 We're not going to use the wire until a year or two from now, but when we do I'll be happy I already have it there. Different topic. I got a new toy today. We would have gotten it eventually anyway, but I finally pulled the trigger. I love it, it makes doing dishes so much easier. 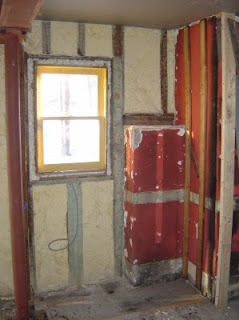 I thought I'd give you an example of what work is involved to put a few sheets of drywall up on the wall. Look at this innocent section of bar wall: Barely four feet wide, a window, some weird something sticking out of the wall (which may or may not support the chimney). What isn't obvious from the picture is, that there is already some furring around the window, which creates a step between the furring and the studs, i.e. more work. Anyhow, here's a shot after all that work is done (by adding a lot of wood). And now that I look at it, I realize that I am still missing some wood below the window, which would allow me to affix a radiator. 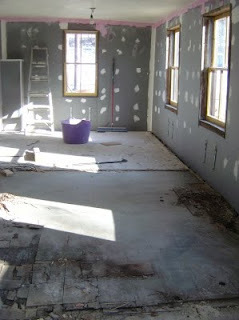 As fast as we moved with installing drywall on Wednesday, as slow it felt the last two days. 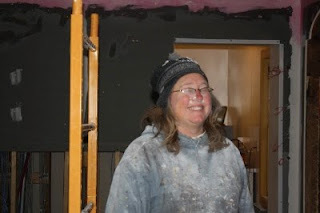 I may have mentioned before (or maybe I didn't, but it doesn't really matter) that the bar is the most tricky in terms of drywalling, because there are so many nooks and crannies, odd and uneven walls, in other words: lots of work. 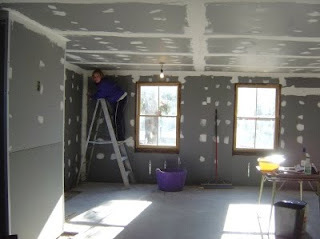 Nevertheless, we got some drywall up on the walls today (and judging from the picture, I should clean the camera lens sometime). It was definitely a slow day. I woke up too early (a little after 5am), and felt tired all day. What a great opportunity for some light work. 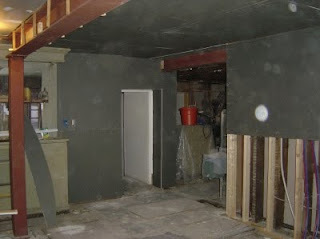 The bar is the main point of entry to Gunk Haus, and hence the home to the hostess. As we are not completely sure on which side of the main entrance the hostess stand will be, I installed phone and data lines on either side. As for the bar, you never know which side you want a point-of-sale system installed, so two more phone and data lines, one on either side of the bar. What we do know is where a wait staff stand will be, and it also needs a phone and data line. None of this sounds really exciting, or is even picture worthy, but now that we start closing the walls, we need to think ahead, and install whatever is needed (and hope we were smart enough to figure out our needs for the next five years). While I was pulling wires out of my wire box, E! 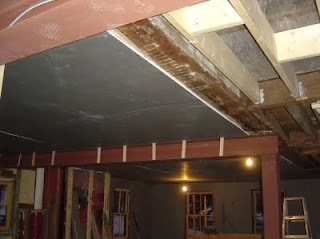 was running around (driving is more accurate) to pick up supplies, like more drywall, and wood to cover the steel beam we had installed last spring. 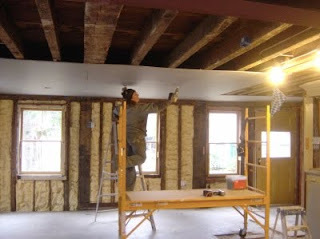 We started installing drywall on the bar ceiling today, which went so well, that we ran out of material by 3:30pm. 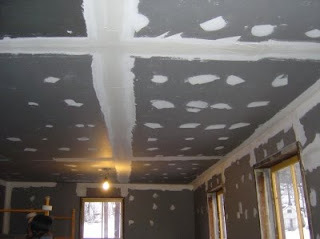 Granted, we didn't have to cut much, but in three hours we had installed seven sheets of drywall on the ceiling. As E! 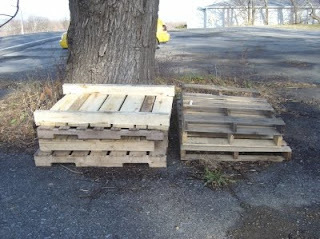 demonstrates in below picture, it's easy peasy. Last Christmas we promised our niece and nephew a playhouse. I always wanted to try timber framing techniques, and this seemed like a good opportunity. As you know, of course, E! 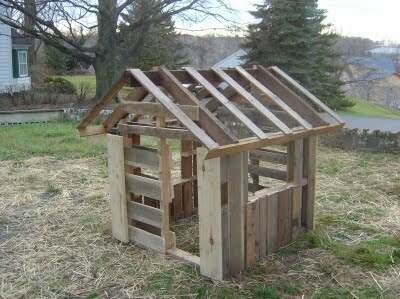 and I are busy enough with fixing up Gunk Haus, so there isn't much time to work on a playhouse. 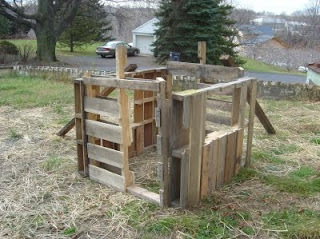 I had all these grandiose ideas and plans, when one day I watched the kids on a playground playing in a little shack-like playhouse. That's when I realized, the whole playhouse idea was all about me, not about them. The best playhouse for kids is the one they have, not a fancy palace with bells and whistles. throw on some slats, and done! 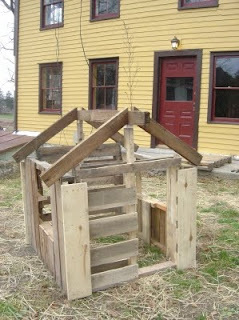 Now, you may say this looks unfinished, and to some extend you're right (although you may want to re-read the beginning of this post about why this is a great playhouse), but at the same time, it gives the kids a chance to work at it themselves (they also did get child-size tool sets last Christmas).